What can I eat to stop heartburn? What is the quickest way to get rid of heartburn? If you have all these questions in mind, We have a complete guide to answering these questions. This is very common in every individual and whoever has experienced the fire in the chest after eating or drinking something is known to be heartburn. We will teach you how to stop heartburn in detail, covering all the points we can and which are helpful to you and will give you in-depth solutions. Many people face heartburn occasionally and many are the victims of it whenever they eat or drink anything. There are many simple steps which can be helpful to soothe heartburn. Lets first learn some basics of heartburn and then go jump to knowing how to stop heartburn. 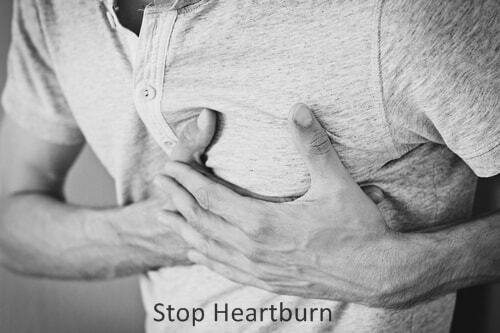 Heartburn is caused when harmful acids are not digested properly. It is painful, majorly in the middle area of the chest, it will give you intense burning feeling. The pain and burning sensations can also go around in stomach upper part and neck. It can last for minutes or can also take hours to settle. lower esophageal sphincter. Basically acts like a gate before the stomach which lets foods and acids go inside your stomach. When This gate opens and closes frequently or is full or is very tight, stomach acids levels are raised and that acids come out from the gate and enters the upper stomach or neck area giving you burnings all over. It is simply termed as an overflow of acids outside the stomach gate and when such overflow happens it causes heartburn. This is where each individual is different and depends upon person to person. But the majority of people who overeat get heartburns, people who eat spicier, people who directly lie down after eating, people who are under stress are more prone to get heartburns. Which Kind of People Can Get Heartburn Daily? Many people who get heartburn daily are people who are:- Smokers, Pregnant, overweight and have a disease called a hiatal hernia. It is common to get heartburn after eating food or drinks, and if you want to know how to stop heartburn then first thing is you need to do is stop these foods and drinks. How to Stop Heartburn Immediately. So now when you have learned the basics on what, how, which people, what to avoid in heartburn etc. We will now show you how to stop heartburn. What to do on an immediate basis if you get heartburn and how can you treat heartburn. 1. How to Stop Heartburn by Simply Buying OTC for Heartburn. There are many kinds of OTC medicines available for curing heartburn. Some of the common PPI's (proton pump inhibitors) are used to smoothen burning. They act as H2 blockers as mentioned earlier which stop acids to develop. Here are some medicins you can buy:- esomeprazole (Nexium), lansoprazole (Prevacid), omeprazole (Prilosec), pantoprazole (Protonix), rabeprazole (Aciphex), dexlansoprazole (Dexilant) and omeprazole sodium bicarbonate (Zegerid). Do not use if you are on other medications. Please ask your doctor to recommend you, as long use of PPI's is not good for health and can give any adverse effect. Completely follow manufacturers instruction and do not take according to your assumptions and knowledge. 2. How to Stop Heartburn by Eliminating Bad Food and Drinks. First of all, you have to eliminate the foods which cause excess stomach acid production. The list you read above is the foods and drinks you need to stop. If stomach acids are produced more by bad foods and drinks, it will get out of the gate and overflow to upper stomach and chest to give you the burning feeling. 3. How to Stop Heartburn by Eating Frequent Meals. We can understand that the people who are into jobs and business have a tight schedule and cannot break up meals. But you have to do it if you want to cure heartburn. When you eat big meals you are putting pressure on your stomach and that pressure goes to the gate and esophageal sphincter. Due to this pressure acids come out and flow towards the chest area giving you heartburn. So eat every 2 hours, break up your meal, make a proper diet plan with no heartburn foods. 4. How to Stop Heartburn by Not Sleeping Immediately After Eating. When you eat food it takes time to digest. So eat 2 hours before you go to bed. Because if you sleep immediately after eating food, the food is not yet digested. The position of sleeping will promote and push acids to come out and give you heartburn. 5. How to Stop Heartburn By Losing Weight. Acid reflux happens when you are overweight. The extra weight which you have is putting pressure on the Sphincter. (termed as the gate in this article for better understanding). This pressure caused by overweight can rise acids to upper stomach and chest giving you the burning. So make a diet, hit the gym, do yoga, do regular exercise. If you lose weight effectively you can cure heartburn. How to stop heartburn by not drinking Alcohol and drinks containing caffeine this can play the role of weakening the gate. Due to caffeine and alcohol, that gate gets lose and damaged for a while. When the gate is damaged acids come out. This happens especially before bedtime. Drinking too much alcohol and having too much caffeine is not good for the digestive system. So stop drinking alcohol and caffeine booster if you want to cure heartburn. How to stop heartburn by not smoking because when you smoke the tobacco and tar disrupt the digestive system. Mainly the esophagus linings, which is the pathway between your stomach and the main gate. When this esophagus gets interrupted by smoking, acid flow is disrupted giving you bad heartburn. Heartburn is generally very strong for people who smoke. The burning sensation is at a higher level than non-smokers. So stop smoking now if you want to cure heartburn. 8. How to Stop Heartburn by Using Tums. Tums is an over the counter medicine gum available to cure heartburn or if you want an alternative to it you can also use Alka-Seltzer gummies. These both chewing medicines are good for stopping heartburn, indigestion and acid reflux. But taking it once in a while is nice, if you have recurring heartburn, then it is advisable to visit the doctor. If you suffering the problem from more than 2 weeks always ask your doctor before taking antacids on a regular basis. Antacids can sometimes not work well with other medicines if you are taking others too. it is advisable to check compatibility before eating. 9. Use H2 Blockers to Cure Heartburn. How to stop heartburn by using H2 blockers, these are such medicines which signal your stomach to stop producing more acids. Once you consume it your stomach won't produce more acids and you will be relieved. Famous h2 blockers are medications like famotidine, cimetidine, and ranitidine. Brand names are Pepcid, Tagamet, and Zantac. 10. How to Stop Heartburn by Drinking Aloe Vera Juice. Aloe vera juice has many benefits for outside the body and also inside the body. The main specialty of aloe vera juice is that it has a powerful healing quality. Go and buy organic aloe vera juice and pour 1/2 cup into a glass and directly drink it without mixing anything. Drink 2 times a day not more than that. Aloe vera helps in decreasing inflammation and stables stomach acid. 11. Use Apple Cider Vinegar to Cure Heartburn. Apple cider vinegar helps to cure heartburn and is the simplest way if you have one bottle kept at your home. It is kind of instant home remedies to cure heartburn. You need to add one tablespoon organic apple cider vinegar to six ounces of water, stir it well and drink it. Do not use another kind of vinegar as it might increase your problems. 12. How to Stop Heartburn by Consuming Lemonade. There are many kinds of citrus drinks but the best is the lemonade if you do not like lemonade try making a drink similar to this with your favorite citrus foods. Take a glass and squeeze pure lemon to it, one lemon is more than enough. Add water and a bit of honey for better taste. As Honey is also a natural sweetener it gives the drink a better taste. You have to drink lemonade before and after the meal, this indicates the stomach to not produce more acids as the levels are at the top. As there will be no acid production the problem of heartburn will be solved. 13. Apple and Acid Reflux. There has always been an old saying that "one apple a day keeps the doctors away". Here Apple is a natural antacid which helps to calm the acid reflux. If you have a heavy burning sensation in your chest and you have apples at home. Grab some and make a good smoothie or eat it directly. This will instantly bring down the acid levels and the burning sensation will be cured. 14. How to Stop Heartburn With Ginger Tea. Ginger acts as an anti-inflammatory agent and has the capacity to stop acids which are coming out from the gate to upper stomach and chest. You have to do this before 30 minutes of having your lunch or dinner. Using fresh ginger is nice but if you do not know how to make ginger tea, its fine to buy a ginger tea bag from the store and make it. If you do not like ginger tea you can also try different types of tea. One of them is fennel tea, it also helps in decreasing the acid levels in the stomach and helps settle it. The other options you have is the chamomile tea and the kombucha tea which also acts as an anti-inflammatory agent. There is loose leaf tea available in the superstores that will be a nice option for you to make chamomile tea. But to make kombucha tea is a bit long process. Kombucha tea you have to make and preserve for heartburns ahead. 15. How to Stop Heartburn By Using Baking Soda. Baking soda will help you to prevent the effect of acids which are giving you tremendous heartburns. Here you have to buy a nice company or branded baking soda and add one teaspoon to 6 ounces of water, then stir it well with a spoon and drink it. You can drink it whenever you get heartburns, not compulsory before or after the meals. 16. How to Stop Heartburn With Coconut Oil. Coconut oil has natural antibacterial properties which stops acid to overflow. There is a particular chronic h.pylori infection which is responsible for more gastric related problems more acid reflux and more heartburns. This chronic h.pylori is sometimes cured by coconut oil and hence coconut oil can also be beneficial in curing acid reflux and to cure heartburn. There are two ways in which you can consume coconut oil, one is directly take coconut oil half tablespoon and consume it. And if you do not like the taste simply add half tablespoon coconut oil in orange juice and have it. You have to do this 3 times daily which is morning evening and night. Do this for 2-3 days and you must be completely fine. 17. How to Stop Heartburn With Probiotics. Your gut contains good bacteria and also bad bacteria, The ratio of good bacteria should always be more to avoid gut problems. One of the gut problems is acid reflux, which can give you heartburns. You can treat this with many probiotics drink available in the superstores. These probiotics drinks are made up of good bacteria, when you consume probiotics, your gut gets a boost of good bacterial intake and hence these good bacteria help in solving gut problems. Also, these good bacteria are known to overall improve the well being. One of my favorite and renowned probiotic drink is Yakult. 18. Maintain Good Sleep Hygiene to Avoid Heartburn. There are many things you should avoid to maintain good sleep hygiene which will indirectly avoid heartburns you having in the middle of the night. It is said by the national sleep foundation that "do not take power naps" as naps during the daytime can affect your daily sleep cycle of night. Do not consume more stimulants such as coffee, nicotine, and alcohol before going to bed. You must have sometimes experienced that when you consume an alcoholic drink in the night and then directly go to sleep, you will face heartburns in the middle of the night which will wake you up. Alcohol will help you sleep but when the alcohol starts to metabolize in the middle of the night that is the time when problems arise. Avoid large meals, chocolates, and foods before going to bed or when you are actually on the bed. Acupressure Therapy can offer instant relief from Heart-burn. Apply intermittent pressure by leeft thumb on the channel of right hand between the bones of last & second last finger, for 40-times. If need be, the pressure can be repeated on the same point after 30-minutes.